Available now at your local quilt shop or wholesale directly from Michael Miller Fabrics. The Highlands is a wild and beautiful land, bountiful in berries, fresh water streams, and pines stretching to the heavens. The Highlands boasts a diverse population of subjects with Squirrels, Felines and Rabbits calling The Highlands home for generations. Her Queenship, Mrs. Kitty Catterson rules The Highlands monarchy. Leadership of the Royal Catelope Guard has been entrusted to Commander Tulip Meowington. Above, "Native Territory" sits atop "Residential", inspired by our 1962 landscape architecture plans. Below, "Sunbloom" inspired by mid-century motifs. Tulip Meowington, IRL (in real life). Local wildlife, predominantly human and canine, know The Highlands as a metropolitan suburb bedroom community developed in the late 1960's. It boasts a significant cat, squirrel, and bunny population living harmoniously in the meticulously planned yard environments and outdoor community spaces near the Urban Boundary. Neighbors are known for their butterfly, bee, and hummingbird gardens. The Highlands is truly all about perspective. "Residential" shows the secret life of our pets with kitty paw prints following a path throughout 1962 landscape architecture plans of The Highlands neighborhood. From the living room, out the back patio, through the yard, across the fence to the neighbor, back home again, across to the neighbor once more and meandering through their front door, out the back and onto the next house. True North guides throughout. Each fabric line I design has a back story, drawn from personal experiences and the world surrounding me. 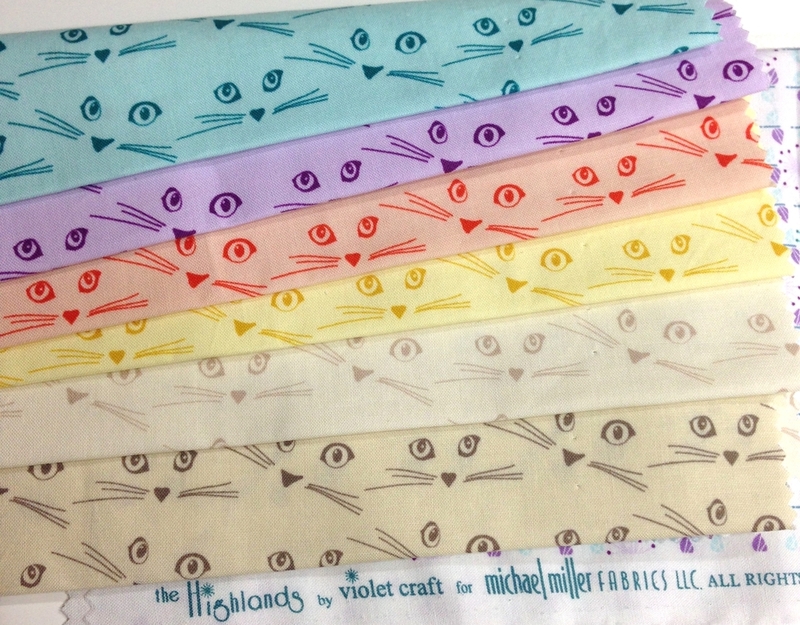 The Highlands mixes 60's modern detailing and whimsical feline motifs. The Highlands range also contains built in low-volume prints throughout. Printed on unbleached cotton and some with a printed cream background to enhance the mid-century feel. "Urban Boundary" contains hidden friends. Can you spot the Queen and catelope along with their friend bunny and birds? The Highlands features a warm citrus colorway and a cool lilac colorway. My color inspiration for the range is compliments of mid-century baths, kitchen appliances and a dash of my own Holly Hobbie bedroom. I freshened the colors for a modern look with the bit of nostalgia. The "citrus" range with Michael Miller Cotton Couture color cards for reference. The "lilac" range with Michael Miller Cotton Couture color cards for reference. For The Highlands lines I designed two quilts, The Boho Quilt and The Mandala Quilt, both are available in my shop!